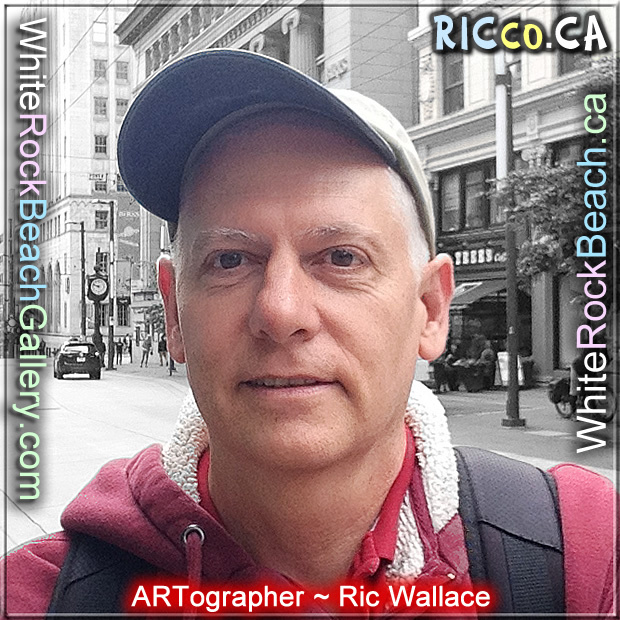 White Rock Beach Gallery founder ARTographer Ric Wallace shares some photos of how his galleries have evolved since spring 2015. 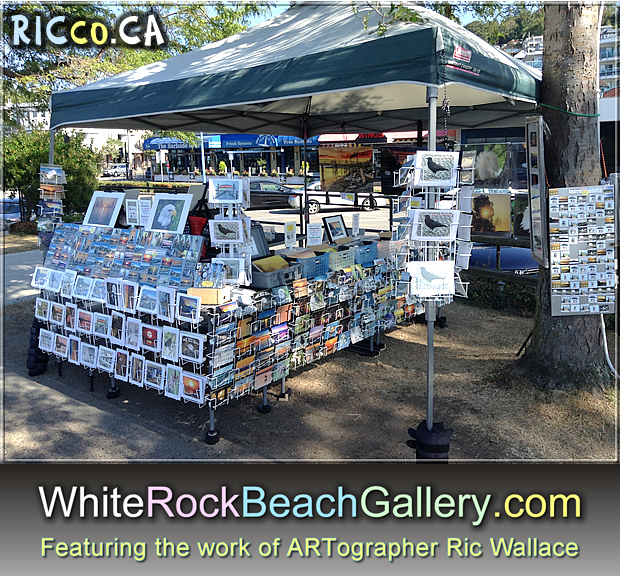 This was an early setup of the Now Famous White Rock Beach Gallery 2015. 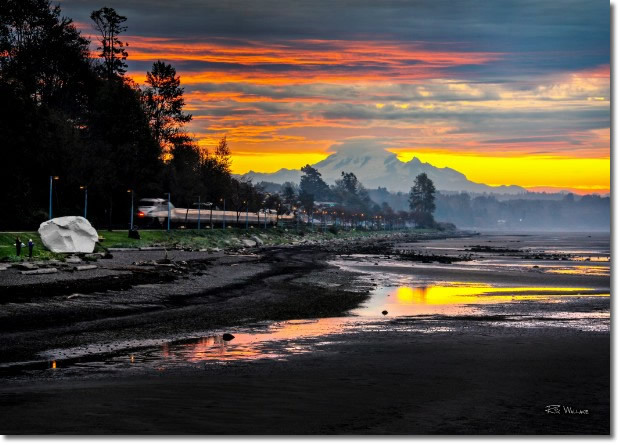 I had never set up one of these tents before. 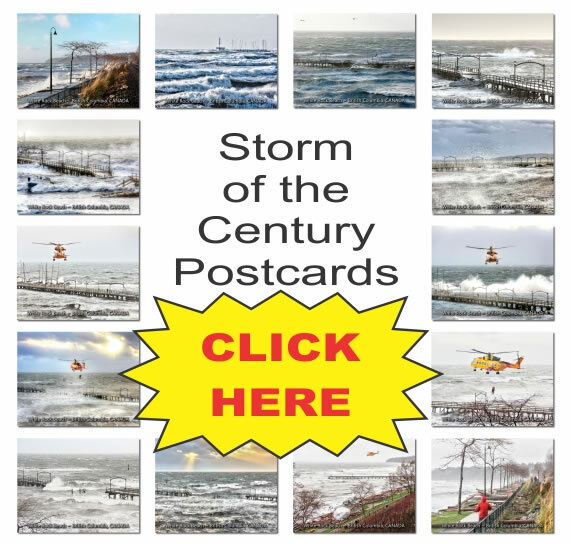 Things learned since then, dealing with wind from the ocean and trains. 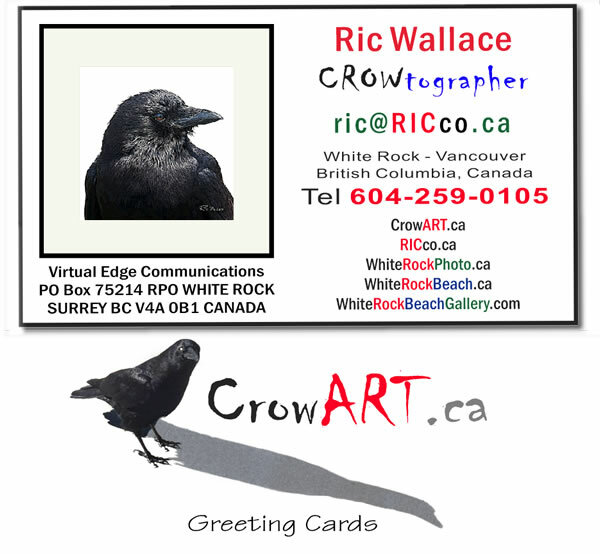 Noise of the trains, I NOW bring hearing protection. 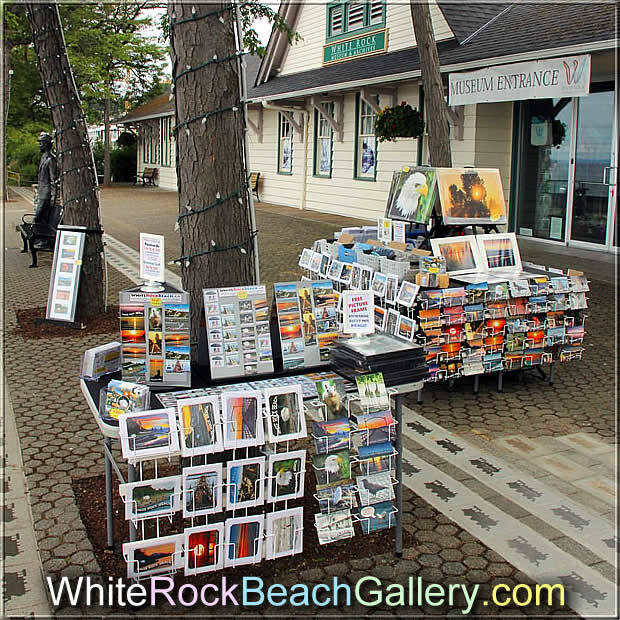 The above display stands are not practical for waterfront display use. 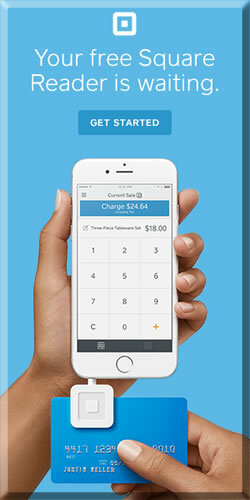 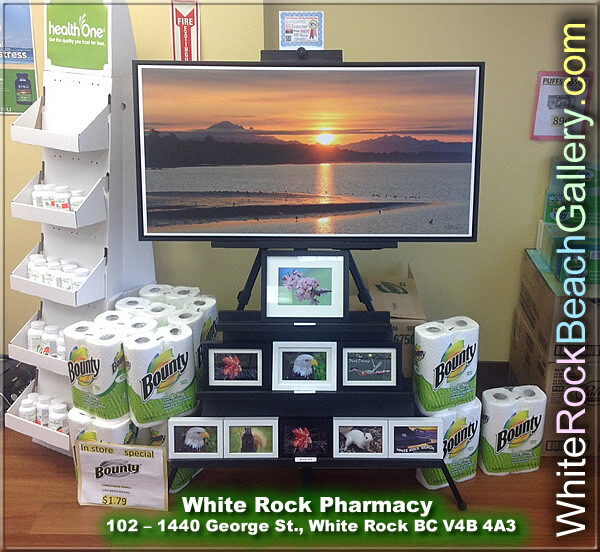 The above setup has only one 24″ x 48″ table. 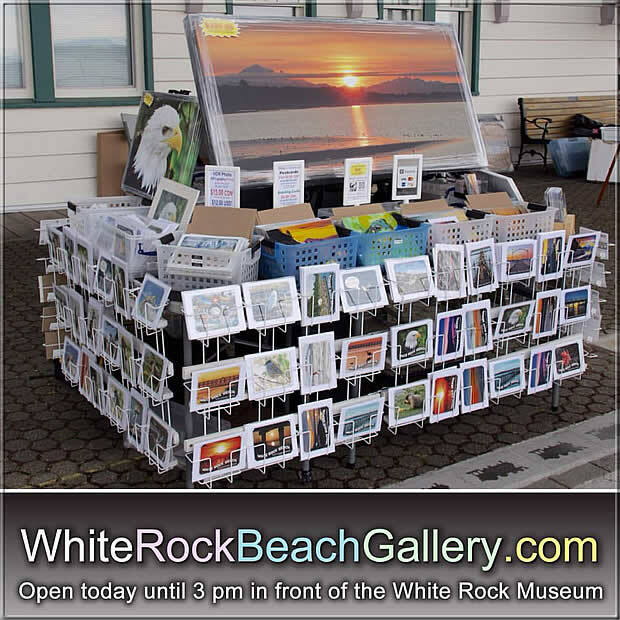 The above setup summer of 2016, FIVE – 24″ x 48″ tables are used, with rubber top mats to stop things from being blown away. 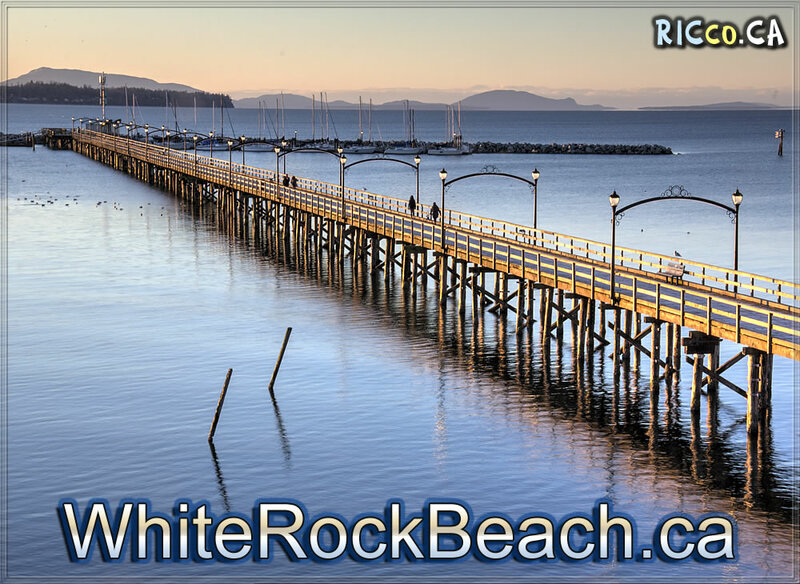 Tables are leveled using customized hockey pucks and wood spacers. 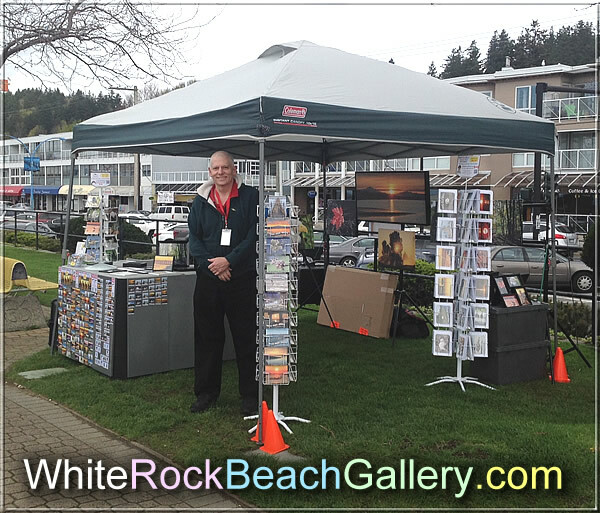 Custom-made postcard and greeting card pockets are mounted to tables and the poles of the tent. 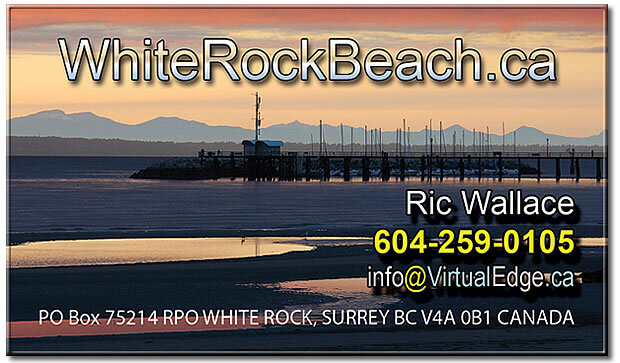 The tent was modified to allow it to support horizontal poles on the back and left side. 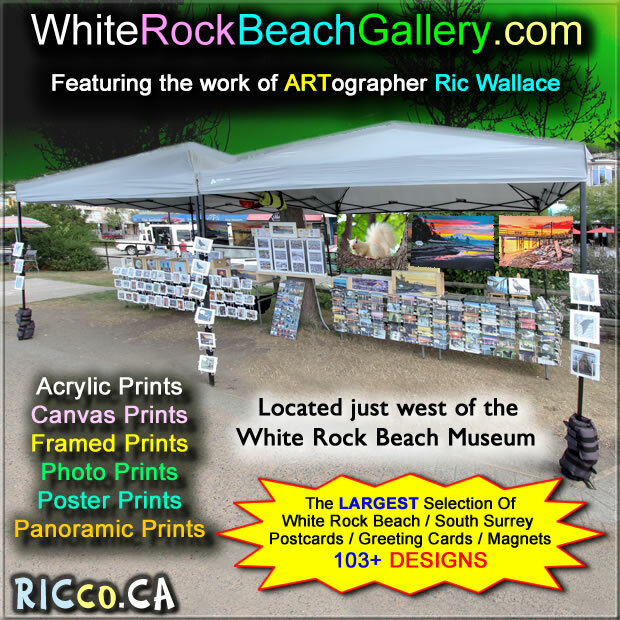 Sixty pounds of ankle weights on the front poles help stabilize the tent in windy conditions. 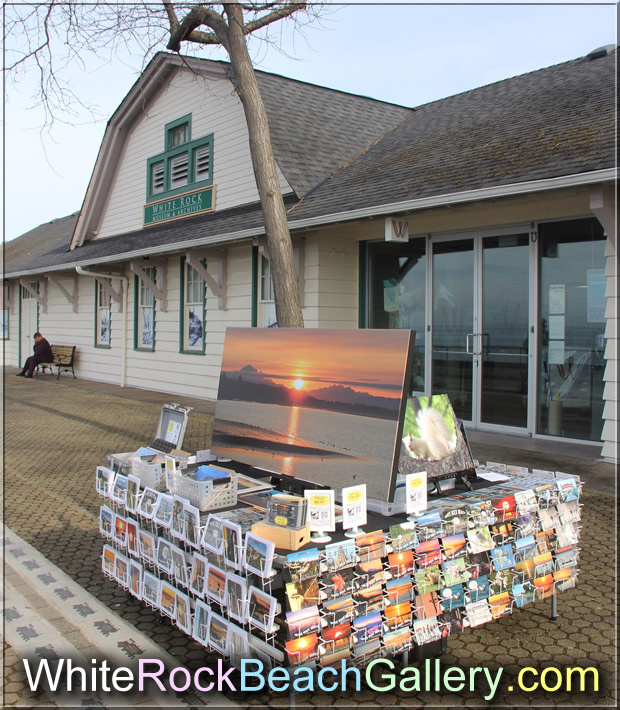 On display are postcards, greeting cards, magnets, 6″ x 8″ and 8″ x 10″ prints, 16″ x 20″ canvas prints, 20″ x 28″ acrylic prints, framed prints and magnets. 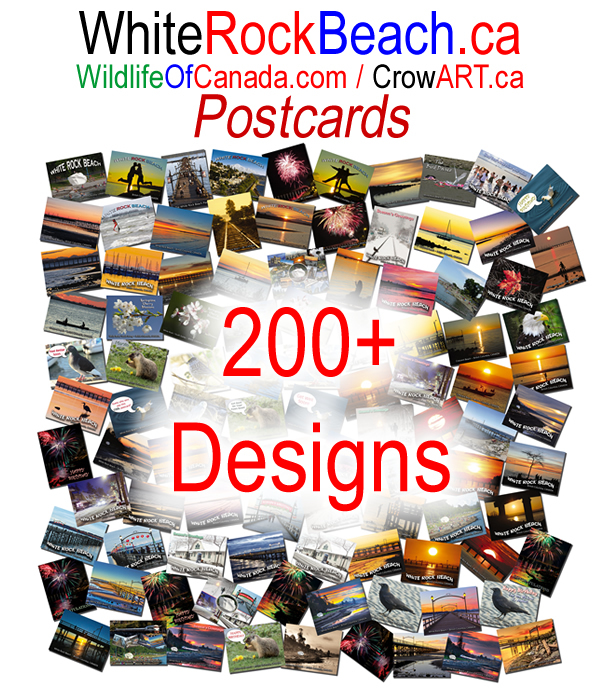 Magnet boards are placed on the table to help create a wall of products. 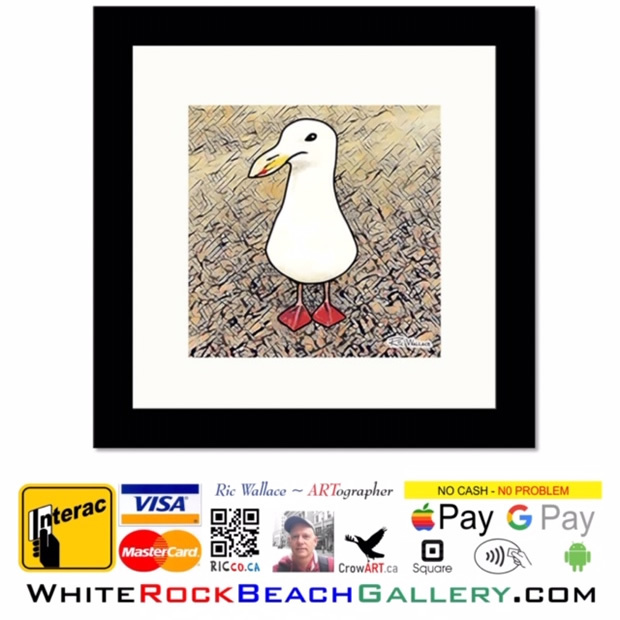 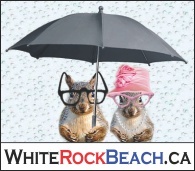 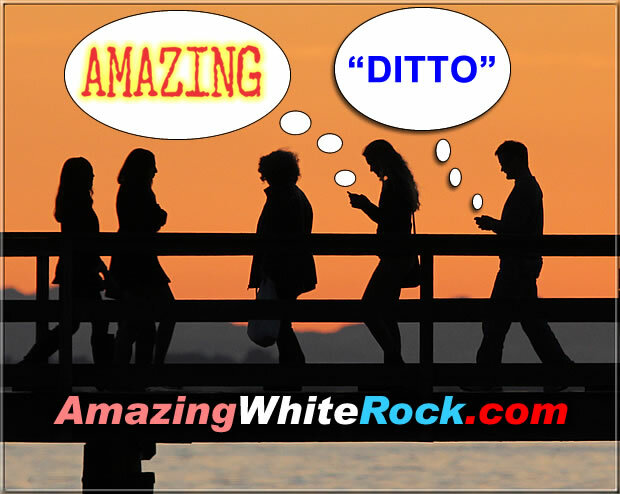 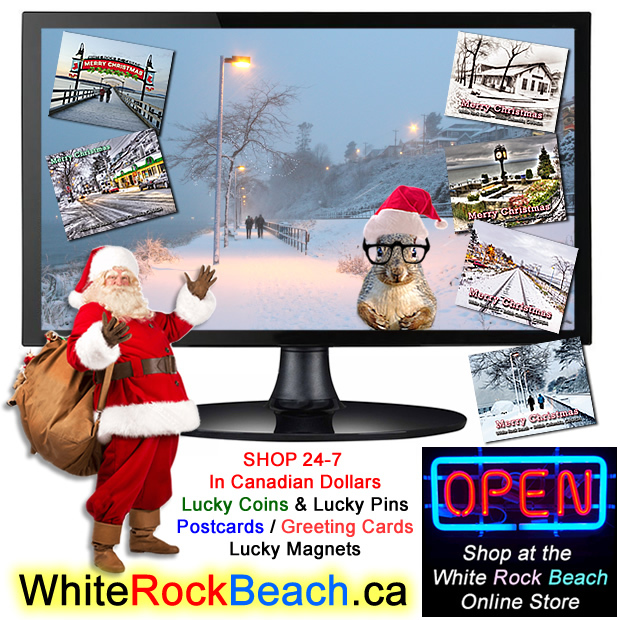 Many of the products are also online for sale on WhiteRockBeach.ca. 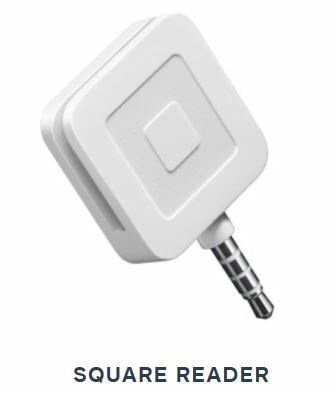 JUNE 2017 above and August 2017 below. 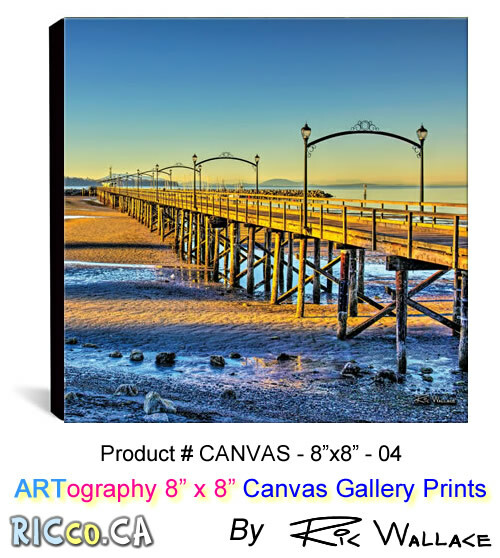 Seeing these photos as Acrylic Prints is an eye-popping experience. 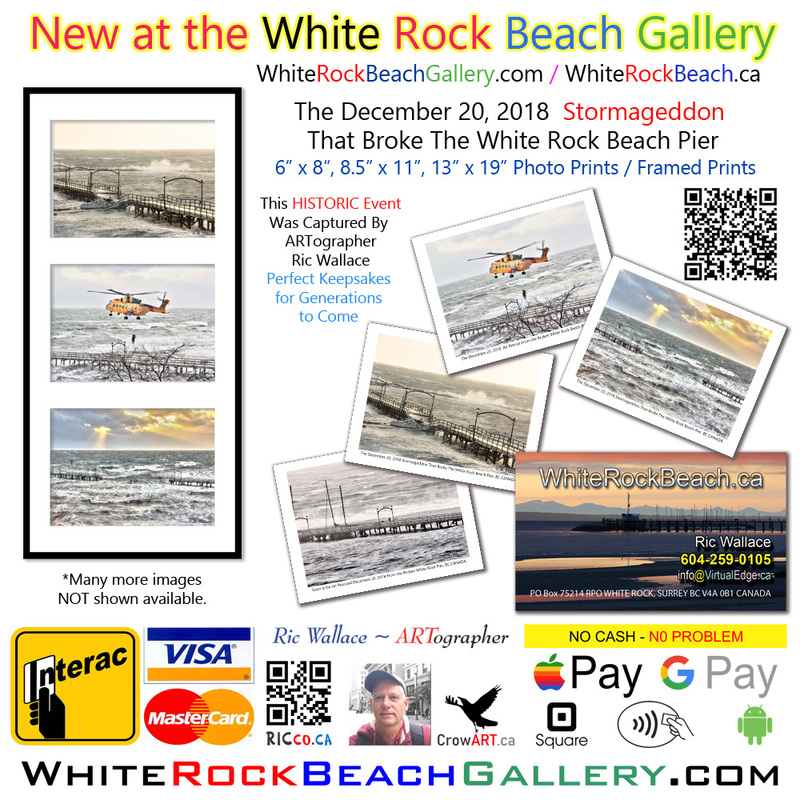 The combination of super-vivid printing, professional-quality materials, and the depth and details of these photos creates a truly magical effect. 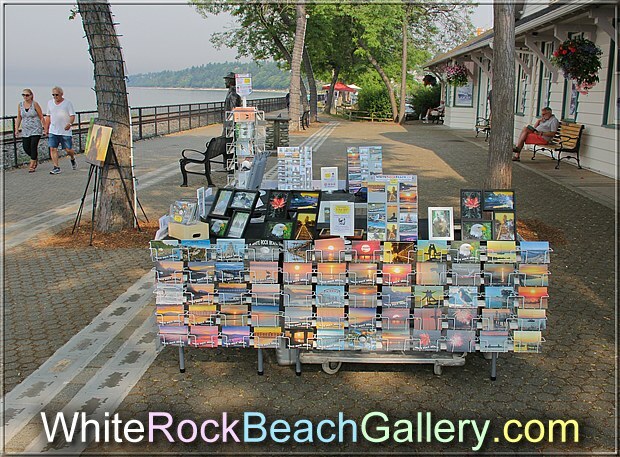 Shown here is a THREE- 24″ x 48″ table setup in front of the White Rock Museum AUGUST 2015. 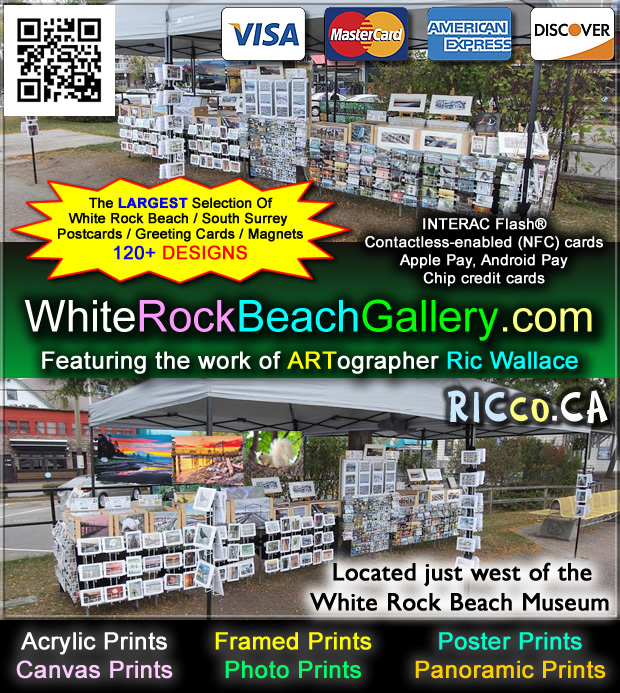 Below is early spring 2016 with FOUR – 24″ x 48″ tables making a perfect 6-foot square, with a hole in the center allowing 4 picture easels. 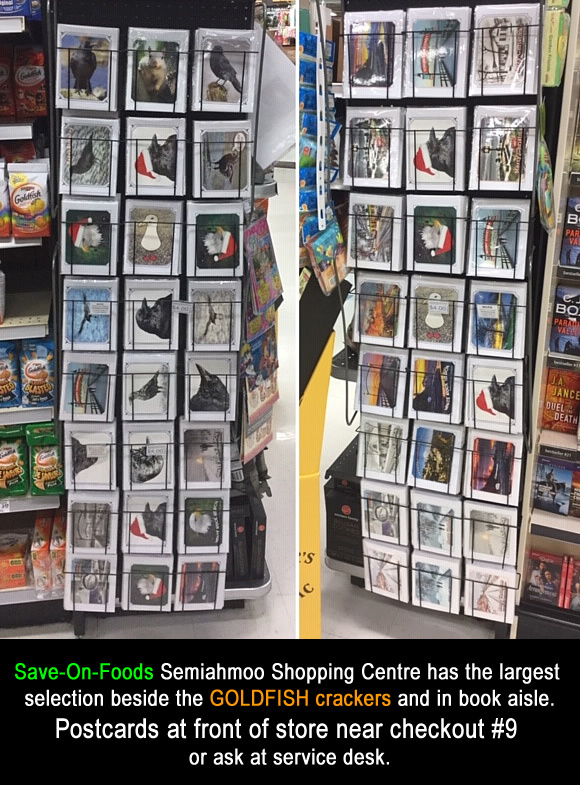 Postcard and greeting card pockets mount to tables, allowing boxes and other items to be stored below neatly. 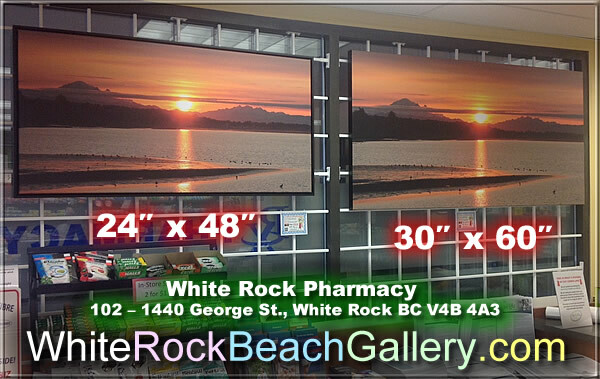 People can walk completely around the display. 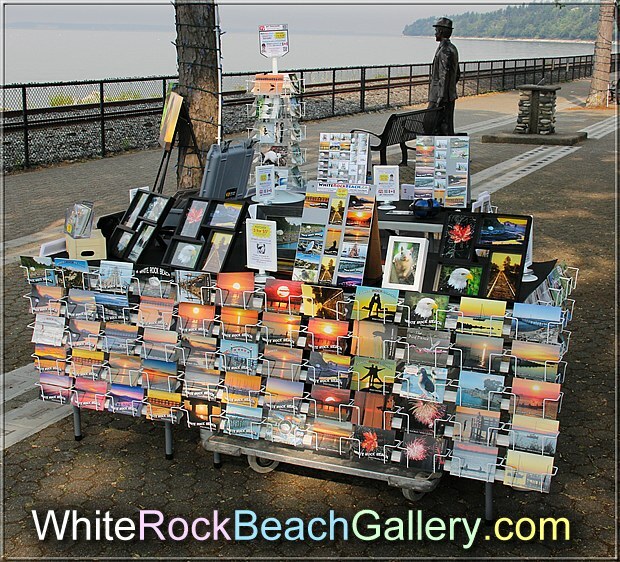 An industrial designer visiting White Rock Beach was very impressed with the display setup; he stopped by to talk and see how it was set up. 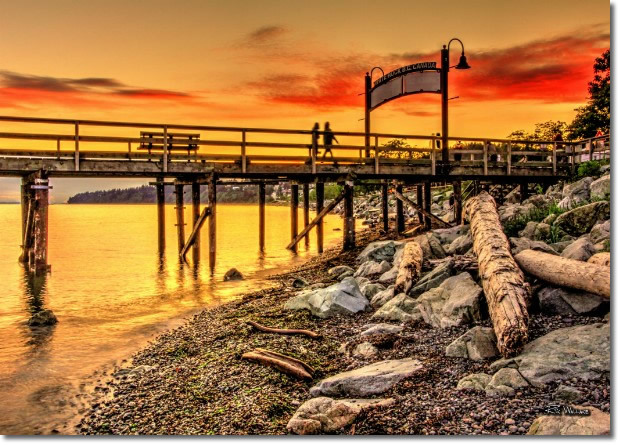 Shown above is a 30″ x 60″ canvas print. 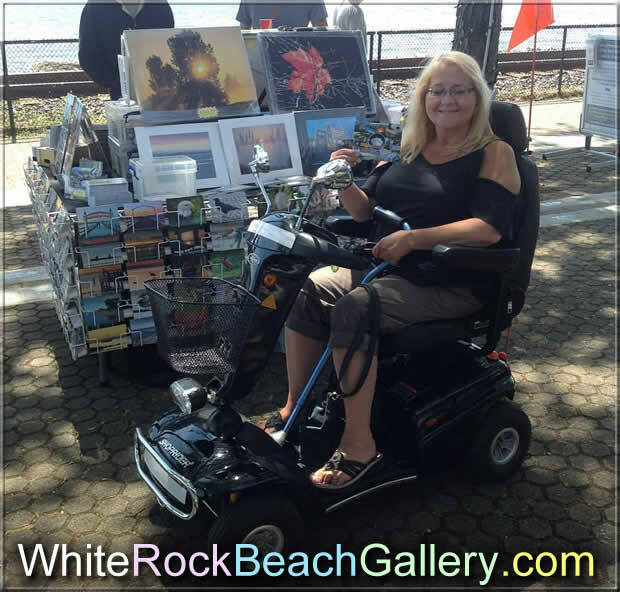 This White Rock Beach Gallery when setup in front of the White Rock Museum is wheel chair accessible. 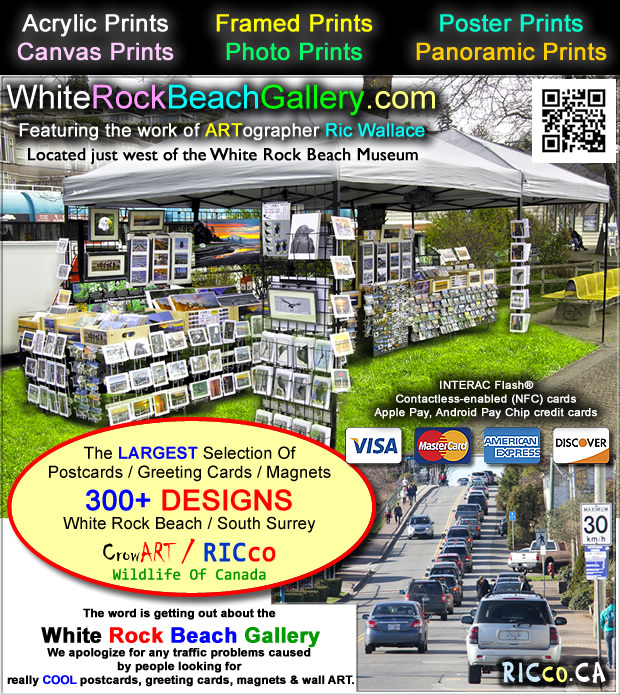 Above is a FOUR – 24″ x 48″ table setup (ONE & THREE) July 2016 – trying a new concept. 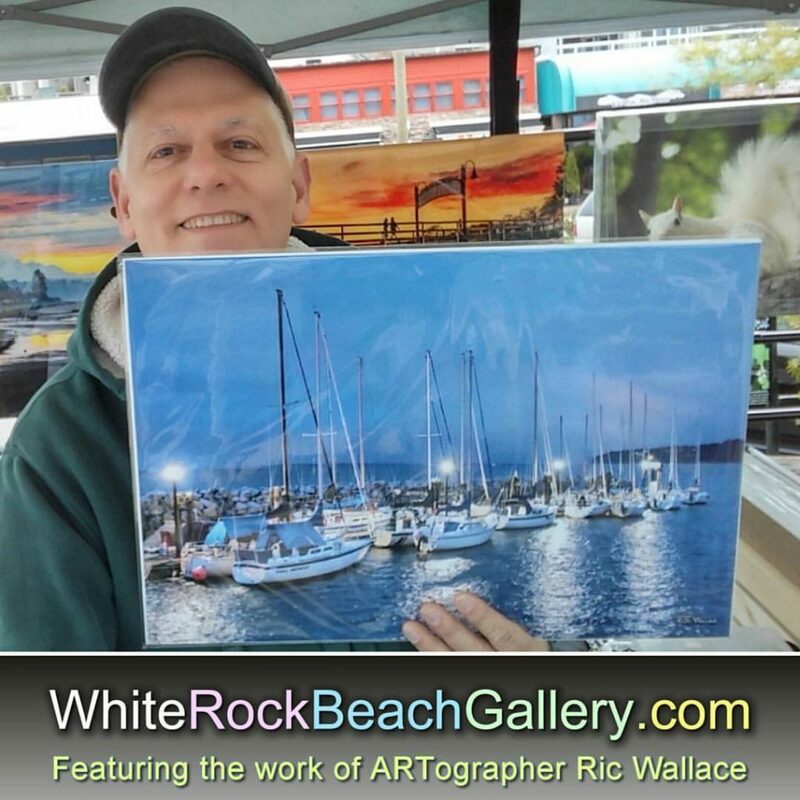 Above is a THREE – 24″ x 48″ table setup Jun 25th, 2016 – trying a reduced setup to hasten set up and take down time. 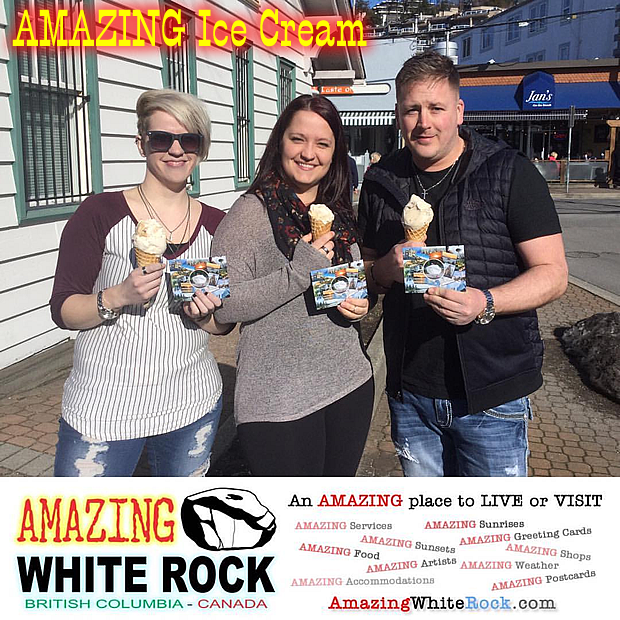 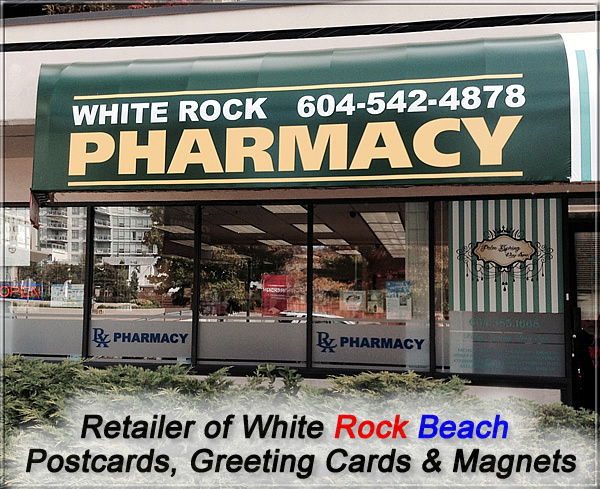 Early spring 2015 a permanent uptown location was set up at White Rock Pharmacy at 102 – 1440 George St., White Rock BCV4B 4A3. 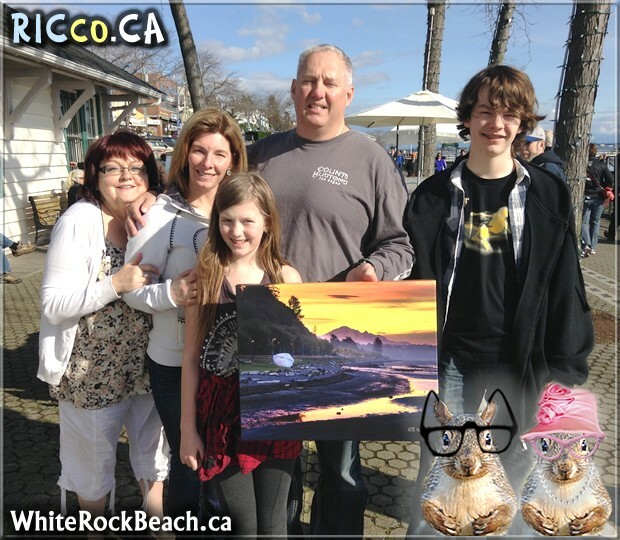 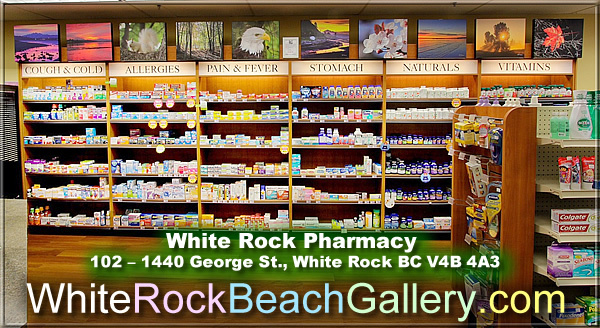 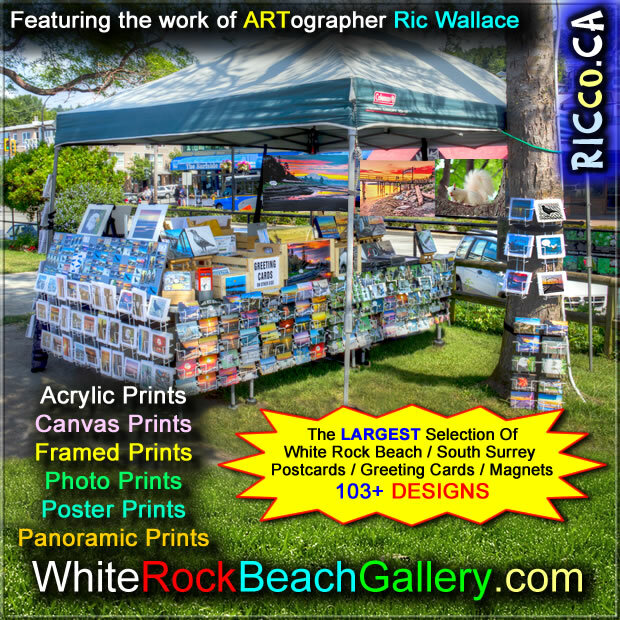 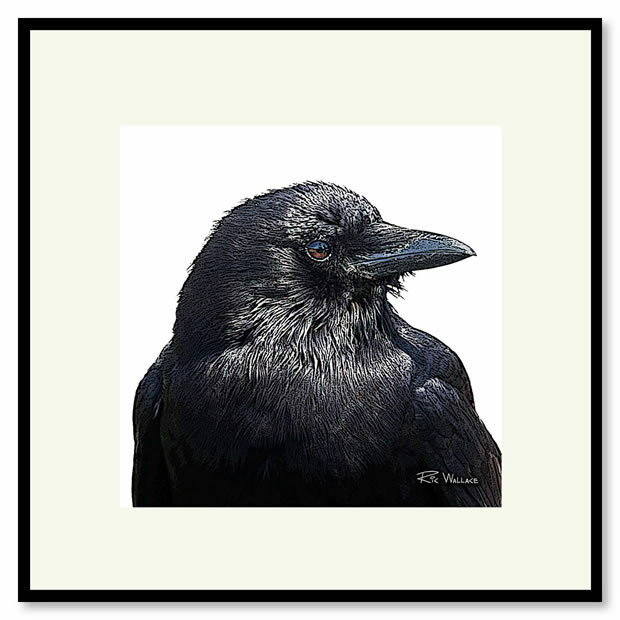 The good people of White Rock Pharmacy are offering Ric Wallace space on their walls to showcase his canvas prints. 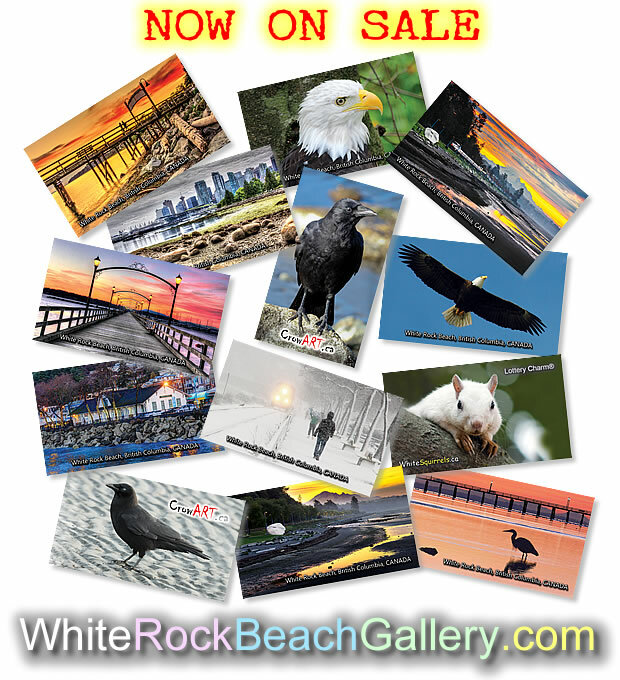 Some of the canvas prints on display and for sale. 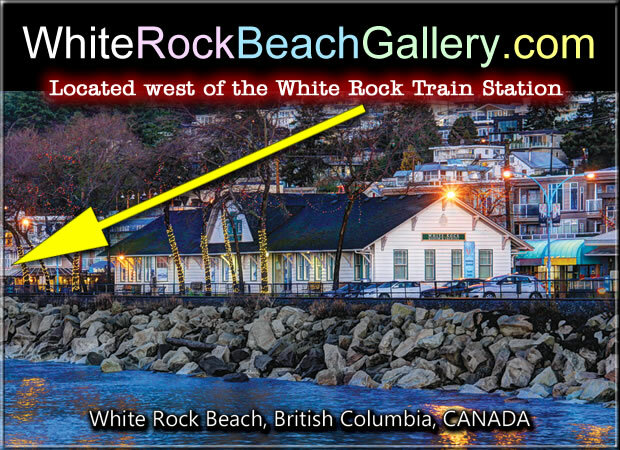 Some of the nice people I have met at the White Rock Beach Gallery..
and slap the back railing. 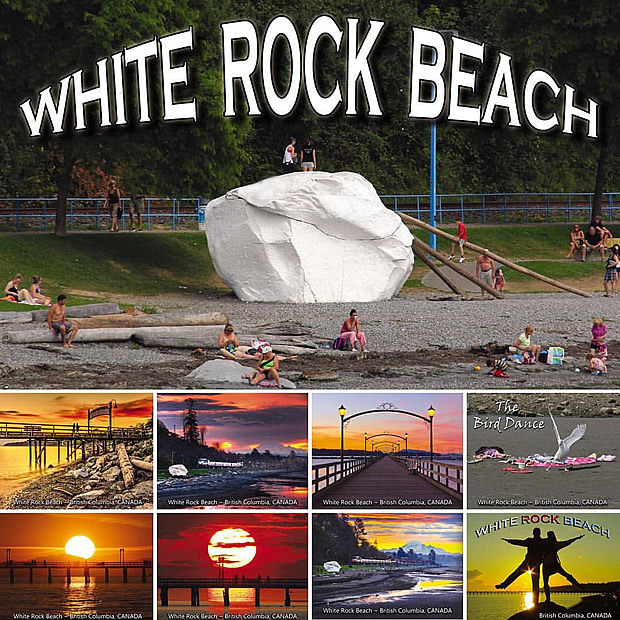 486 ton White Rock for LUCK. 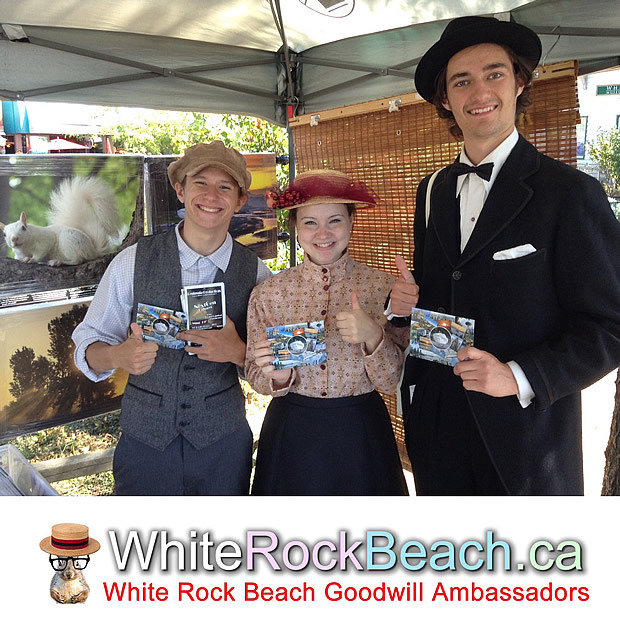 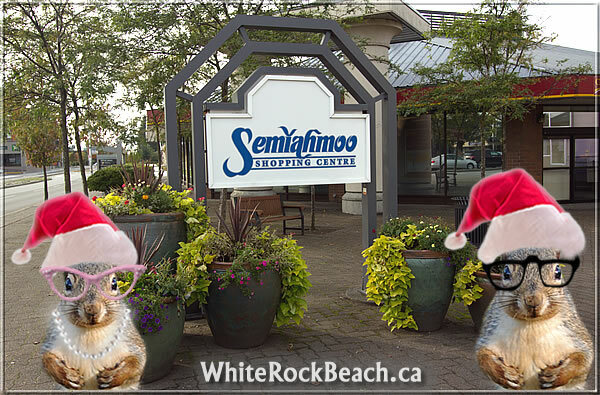 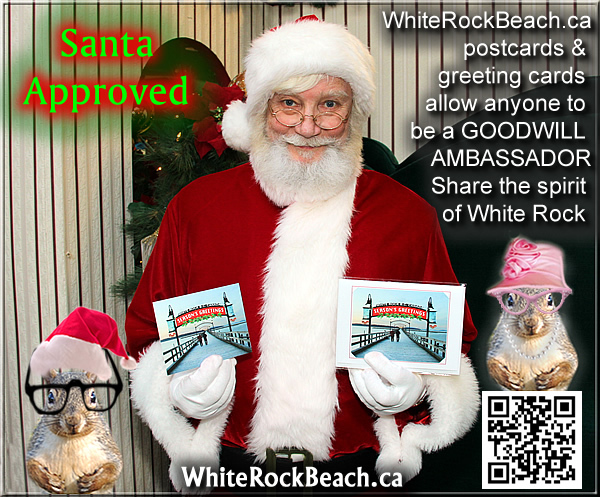 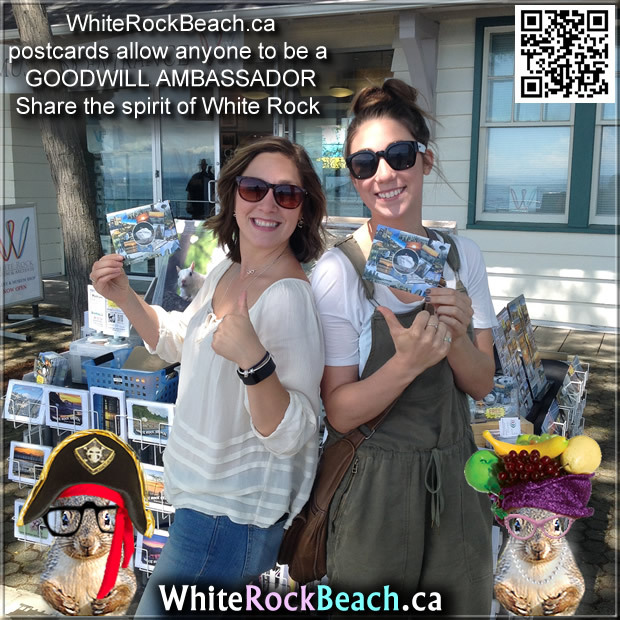 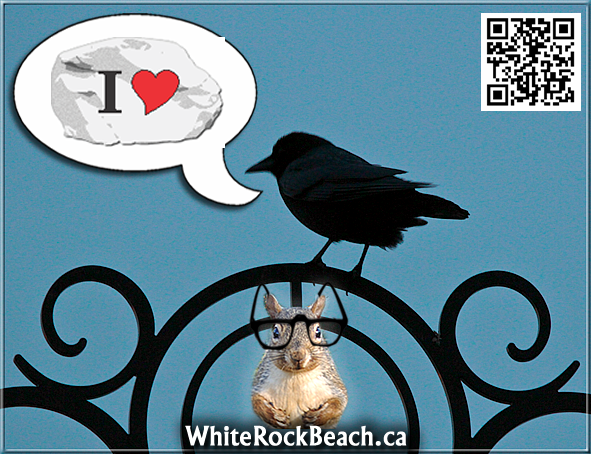 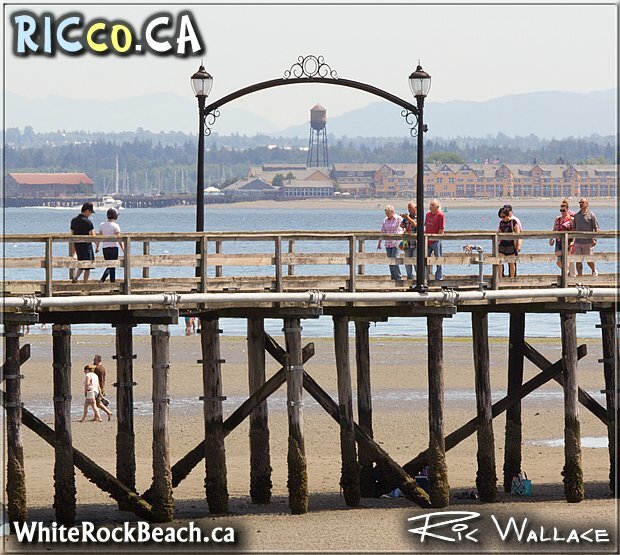 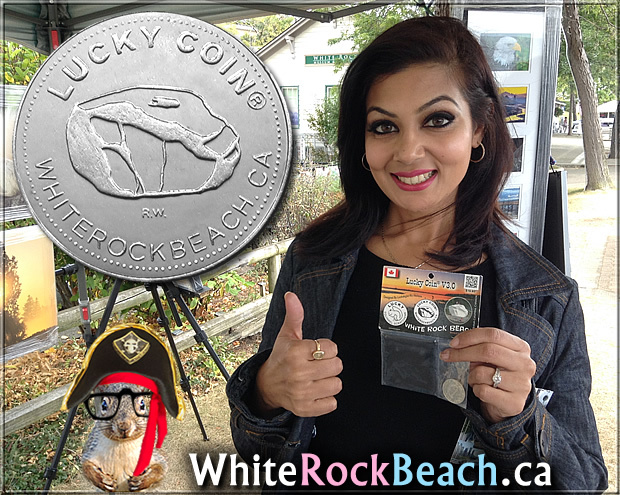 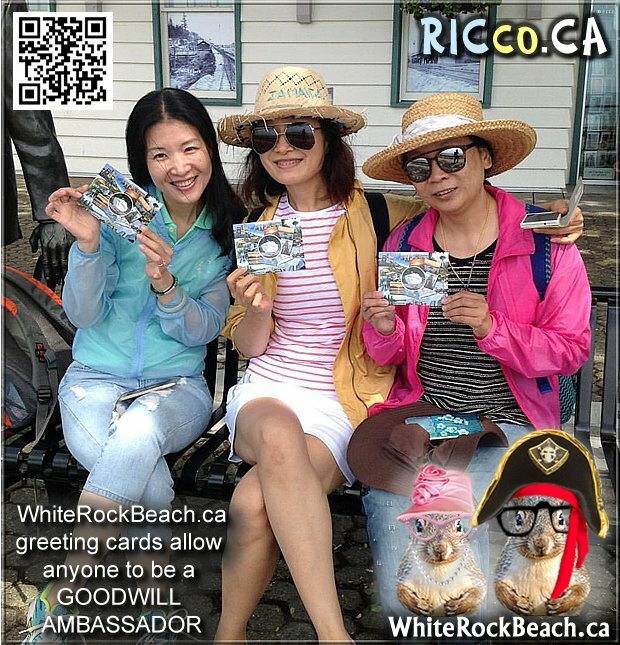 Official White Rock Beach Goodwill Ambassador. 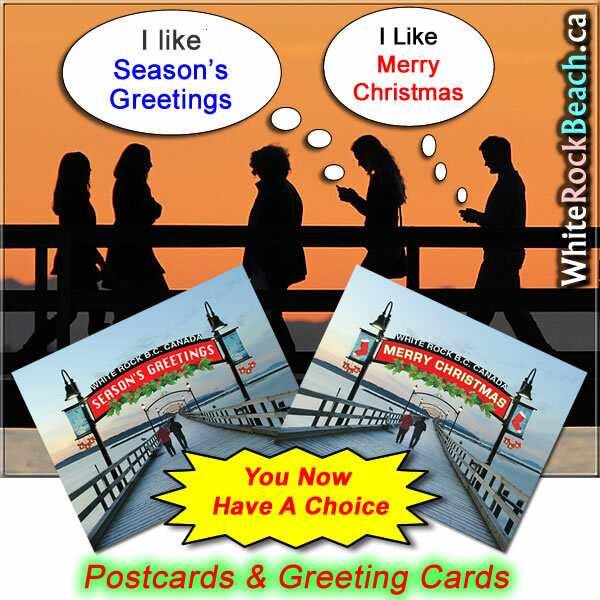 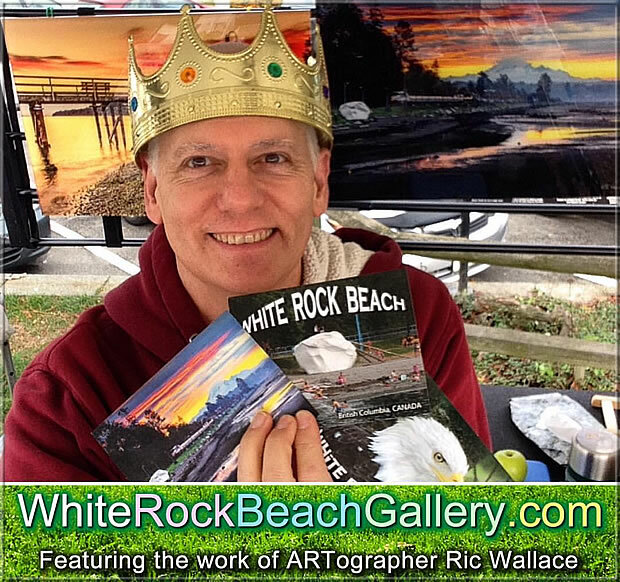 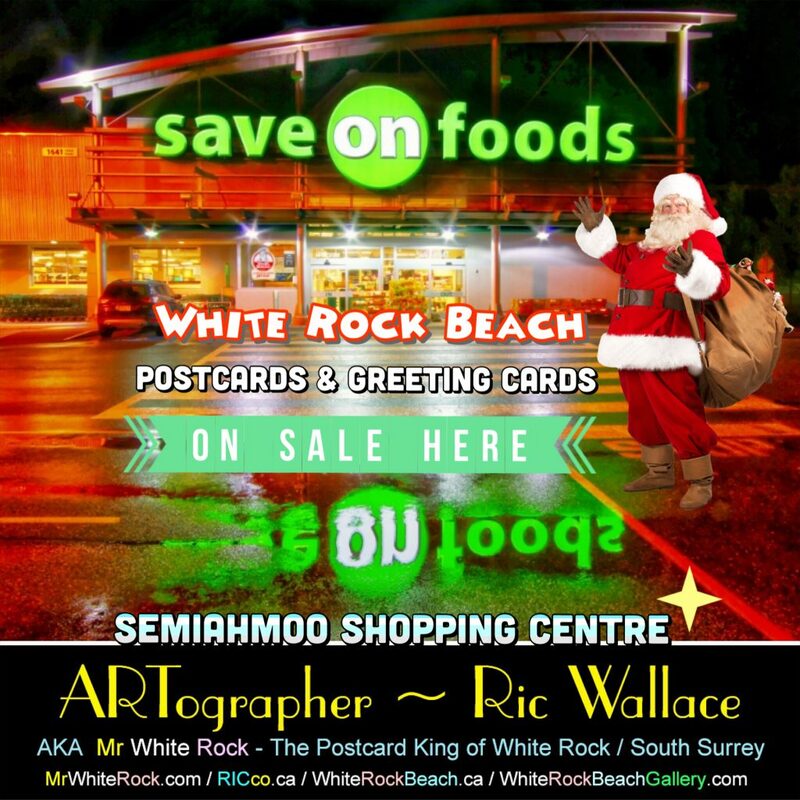 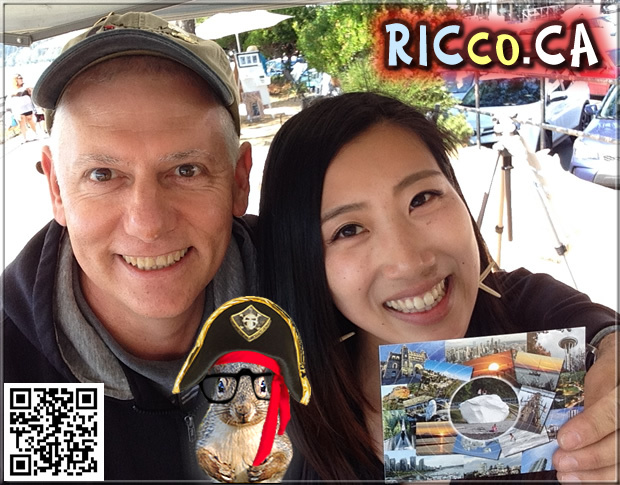 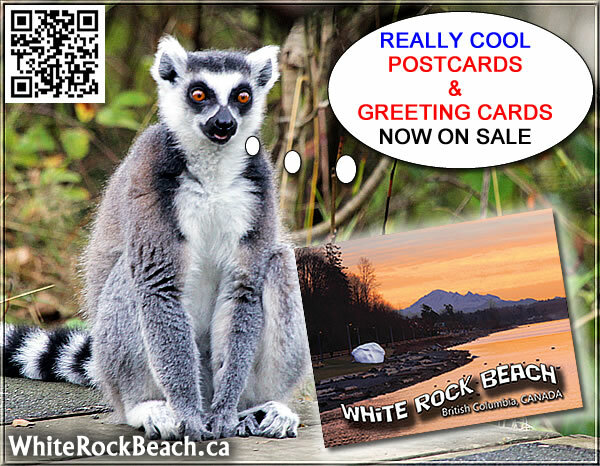 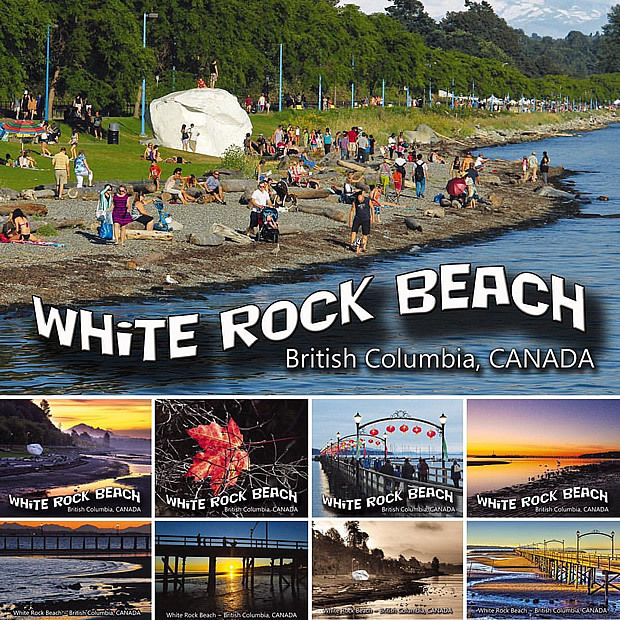 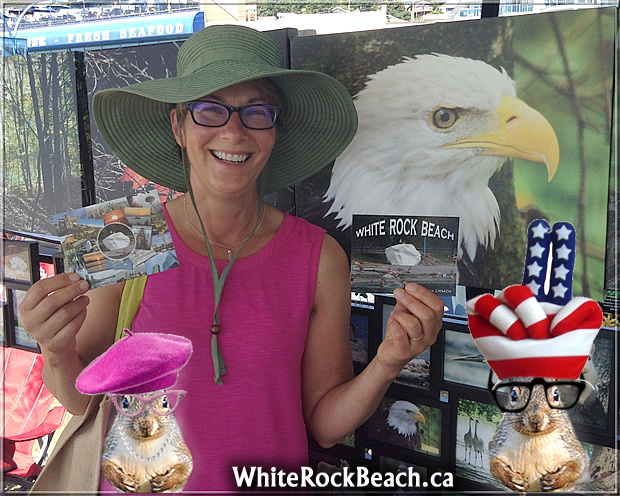 Postcard King Ric Wallace has produced over 101 White Rock / South South postcards and greeting cards with NO TAX dollars or funding. 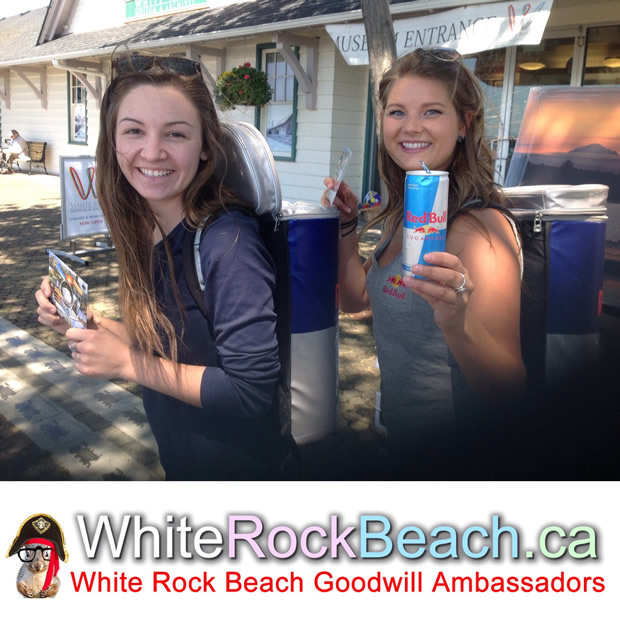 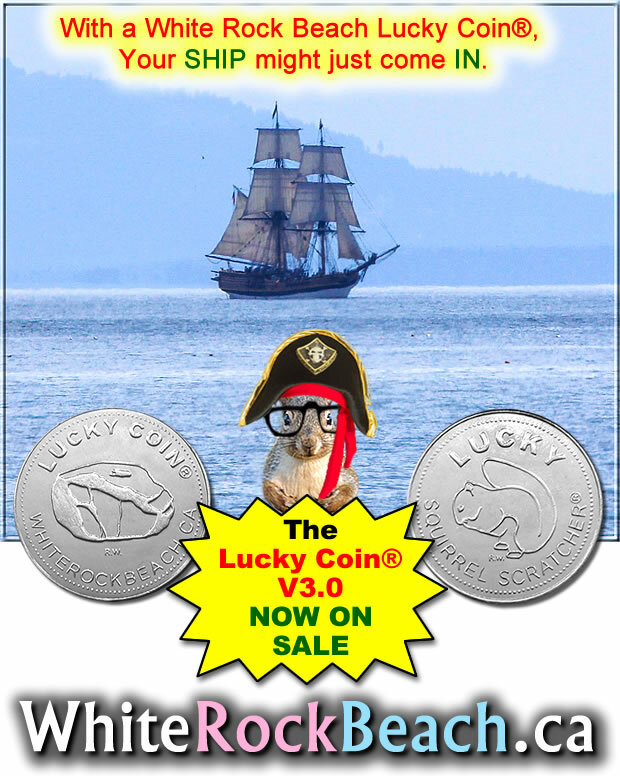 Theses products support the efforts of WhiteRockBeach.ca. 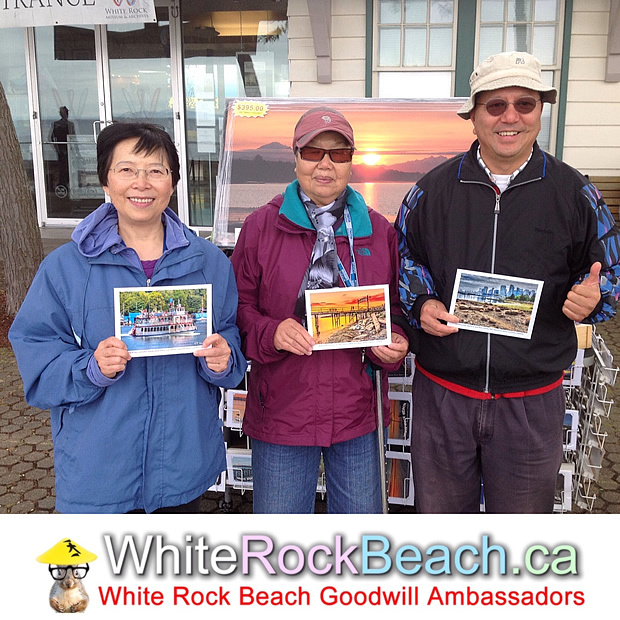 Stop by and get your photo taken for FREE.